Since I moved to the wine country over two years ago, I’ve seen it go through all of the seasons twice. I’ve been through lots of rain to draught and sunshine to that very worst nightmare of the California fires. Because I’ve seen a lot in a short amount of time, I thought putting together this post might be of use for all of you who wonder when is the best time to visit this beautiful region. Now, the obvious reason to visit Napa Valley is obviously to come for the wine, but I imagine you might want to take other things into consideration as well. Do you care about the weather or would much rather come when there’s less tourists around? Maybe you wonder what time of year will give you the best bang for your buck? Or you just want to take beautiful photos? If you’re looking for answers to all of these questions, you came to the right place! Come in December – February. 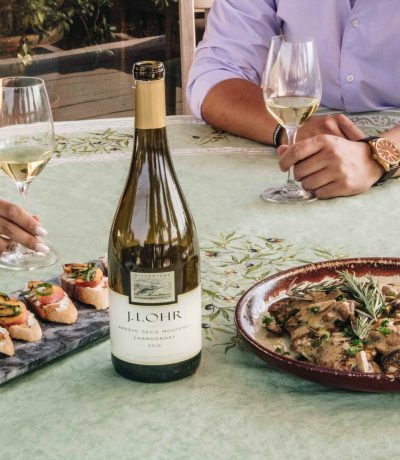 This time of year is considered to be slower in the valley, so you have a better chance of scoring good hotel deals and getting a last-minute reservation for a wine tasting anywhere you want. A lot of my friends who work in the wine industry also say that you are guaranteed a more personable experience in the winter, because of less tourists coming in and out of the valley. Yes, the vineyards are dormant (bare) in the winter and there’s quite a bit of rain, but the valley is truly beautiful year round. An absolute must when visiting in January is definitely the Napa Valley Restaurant Week, where you can try some of the best culinary spots on the map for a fraction of the usual cost. January through March Napa Valley transforms into a yellow mustard dreamland! The views are so incredible and you can’t help but pull over to take photos right away! As you can imagine, this is when traffic starts to pick up a bit in the valley although it’s still considered to be slow season. If you want to see the vineyards change into beautiful colors, I would recommend visiting in October – November. 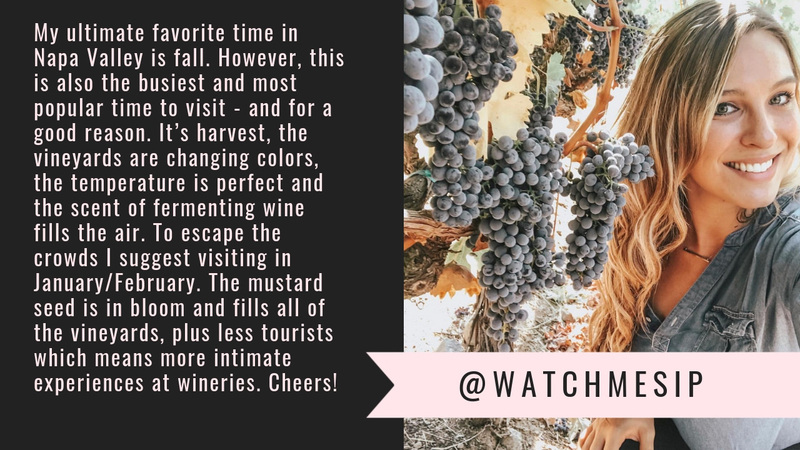 It’s definitely a fun time in the valley because you can still see harvest in action (usually happening in September through October), experience stomping grapes and a bunch of wine release parties. This is also the best time to enjoy the last of the beautiful California weather (temperatures during the day can still go up to 80-90 degrees). 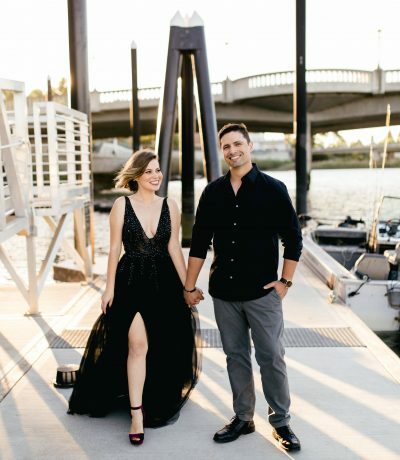 Lucky for you, we have so many great events going on in the valley! Whether you’re interested in music, art or food, we have something for everyone! January – Restaurant Week – the best way to check out Napa’s amazing culinary scene for a fraction of the cost. April – Arts in April – a whole month devoted to arts and cultural events across the Napa Valley. May – BottleRock – our favorite big music festival! We go every year and absolutely love it! Read more about the festival here. June – Napa Valley Jazz Getaway – enjoy four days of jazz! July – PorchFest – a day filled with Napa local performances on porches + music and food. July – Margrit Mondavi Summer Concert Series – live music each Saturday of July held at Mondavi Winery. Tickets sell fast! August – Blues, Brews and BBQ – live blues in downtown Napa + you get to taste micro-brewed beers, and homemade BBQ. October – Safeway Open – a PGA golf tournament + music, food and wine held at the Silverado Resort and Spa. November – Live in the Vineyard – by invitation only music festival. A weekend filled with more intimate, exclusive live music performances at many wineries in Napa. A great way to mingle with your favorite musicians and taste some food + wine! See my 2018 recap here. November – Napa Valley Film Festival – you get to see movie premieres (small Indies to bigger productions), live panels with actors and filmmakers + wine events and culinary presentations. Read all about my experience here. Sound like fun, right? Our beloved wine country truly has so much to offer! 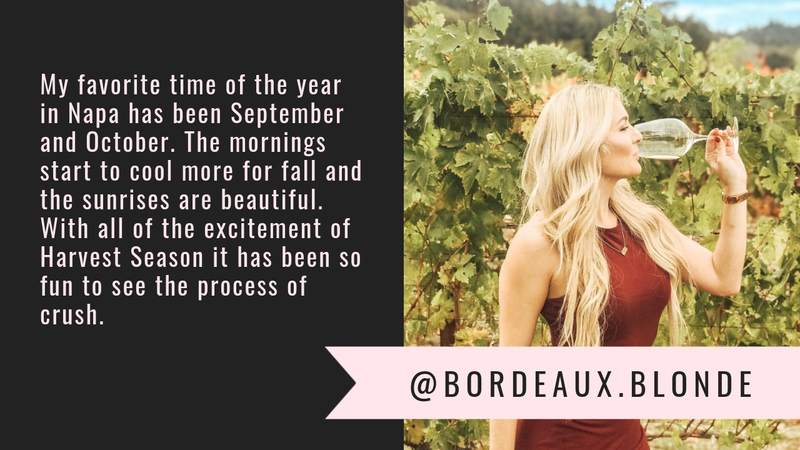 If all this still didn’t convince you to visit Napa Valley, check out what some of my favorite wine bloggers and influencers had to say about their favorite season in the Valley. 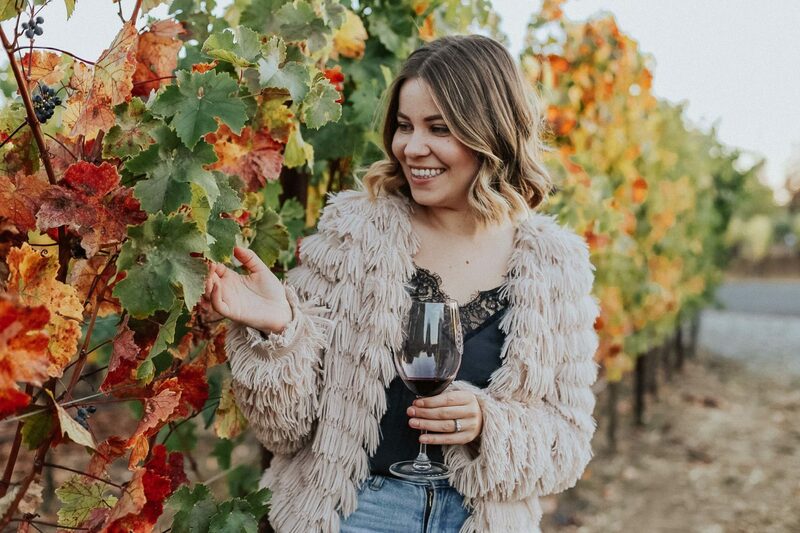 Raquel of Watch Me Sip not only writes a blog but also works in the wine industry so she’s full of knowledge and tips for visiting Napa Valley! 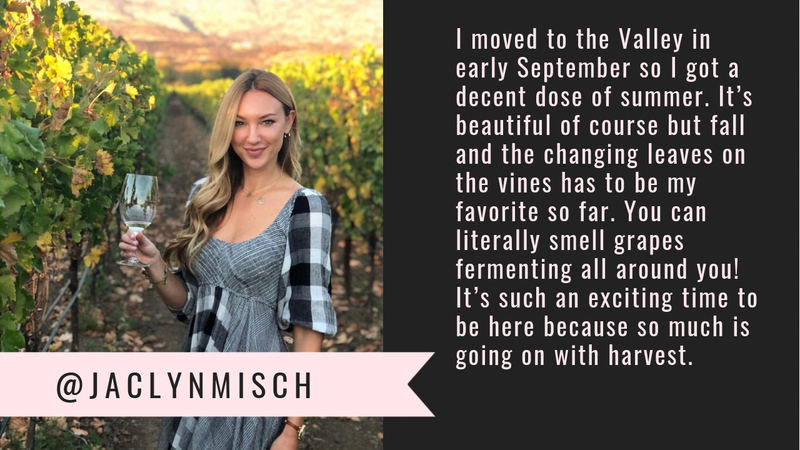 Jaclyn is a former Miss Michigan, CBS Survivor runner-up, and currently she lives in Napa Valley where she attends the Culinary Institute of America as a Wine and Beverage Grad Student. In addition, she shares her infertility/ surrogacy journey on the blog, so follow her for all the real, honest and raw life talk as well. Sara works in the wine industry as well and she loves exploring Napa Valley one winery at the time. 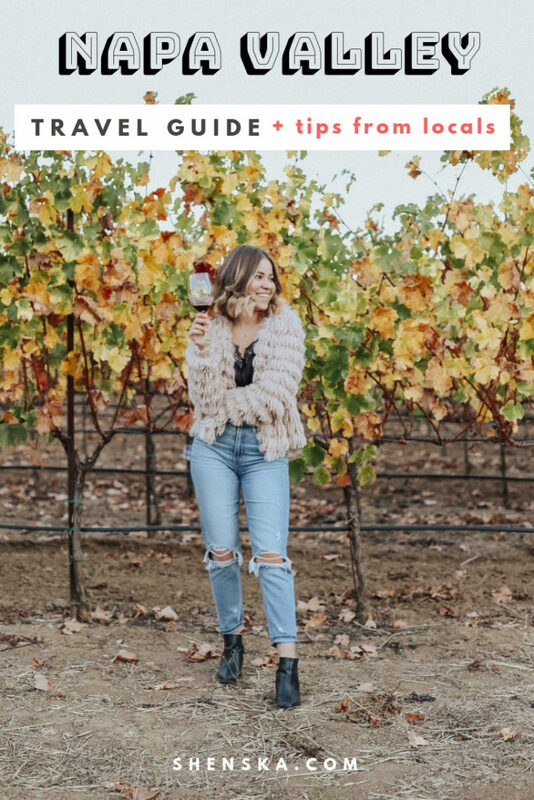 Check out her blog every Wednesday for the winery of the week feature. Samantha is a Certified Sommelier and loves to share recipes and wine tastings through all the hidden gem wine regions! Another way to find Samantha’s work is on AZ Channel 3, where she frequently talks about wine. 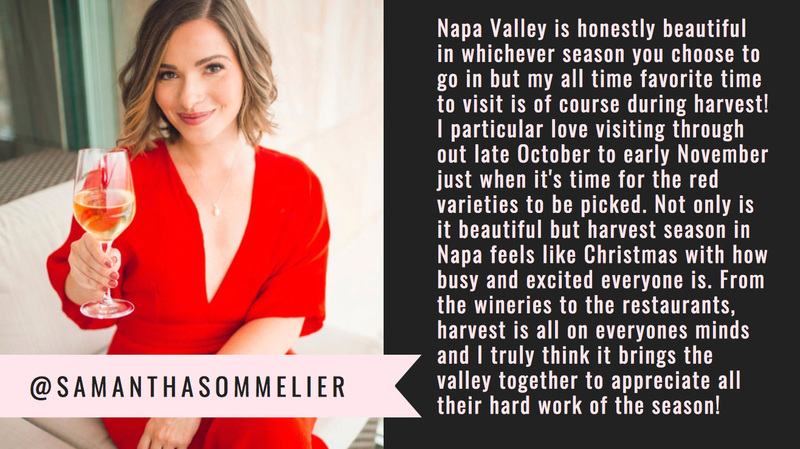 Kristen is a Minnesota-raised + San Francisco-based wine lover. 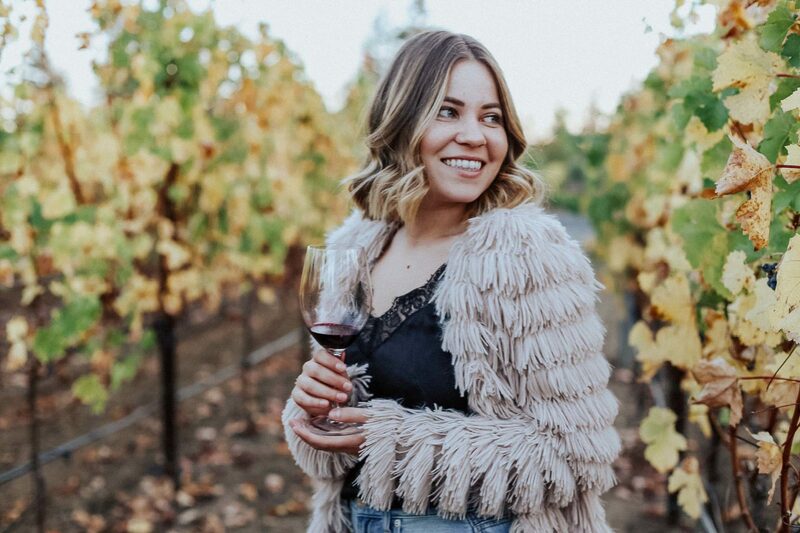 She is a content creator who is passionate about sharing wine, food, and blogging inspirations on a daily basis. 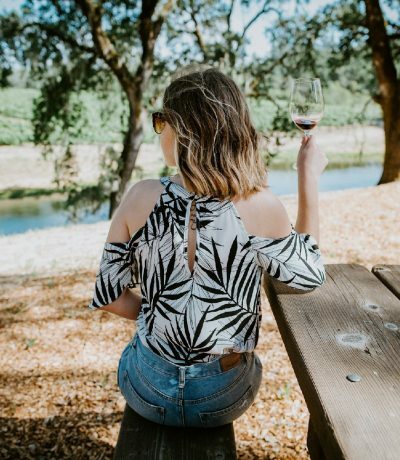 Follow her for a guide to living your best Wine Life! Have you ever been to the Northern California wine country? What is your favorite time to visit Napa Valley? To save this Napa Valley Travel Guide into your Pinterest board, hover over any photo and click on the Pin It button in the right top corner. Thank you for sharing the love! Fab post full of really useful advice – thanks! I’ve never visited, but if I do it sounds like I would love visiting in the fall! Ah yes! Like I said Napa is beautiful year round but fall is such an exciting time in the valley! I want to come to Napa immediately! And you are so cute in this coat! Well if you do come, let me know!!!! Great guide dear! Thanks for sharing! Napa Valley looks amazing and a perfect place to visit for wine lovers! Great tips dear. These are great tips – thank you for sharing!